Glencoe is the village lying at the foot of Glen Coe where the River Coe flows into Loch Leven. The original settlement here was at Invercoe, on the north bank of the river. This was one of the scattered villages of the MacDonalds at the time of the Glencoe Massacre in 1692: more information about this notorious incident can be found on our Glen Coe page. By the mid 1700s there was a ferry operating across Loch Leven from Invercoe to Callert House on the north shore. From there a path led across the shoulder of Mam na Gualainn at a height of 475m or 1,560ft before dropping to the line of the old military road from what is now Kinlochleven to Fort William, a route today used by the West Highland Way. On the south shore the ferry connected with a road which followed the north bank of the River Coe up Glen Coe to Kingshouse on the edge of Rannoch Moor. The lower parts of this road remain in use as far as a junction with the A82 a mile east of the Clachaig Inn and provide a very scenic, though single track, alternative route into or out of the village. By 1850 the settlement at the mouth of the River Coe was generally known as Glencoe, and by now the larger part was on the south side of the River Coe, close to the point where the river was crossed by the Bridge of Coe, the more easterly of two bridges built within a third of a mile of one another in the late 1700s. Meanwhile, steamers from Glasgow had begun to call at the pier here. 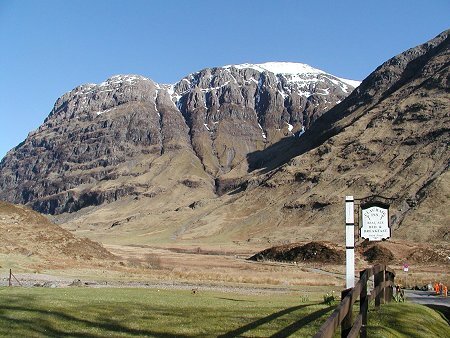 In the 1930s a "new" road along Glen Coe was built along the south side of the river in the lower glen, bypassing Glencoe. This process was effectively completed when the Ballachulish Ferry was replaced by the Ballachulish Bridge in 1975 and drivers no longer diverted through Glencoe around the head of Loch Leven at Kinlochleven to avoid the ferry queues. 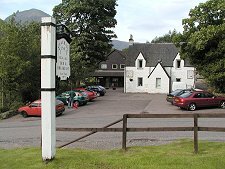 Glencoe's response was to spread towards the new main road, and the Glencoe Hotel was built in 1939 on what is now the A82. Opposite it is the headquarters of Glencoe Mountain Rescue. This attractive white-harled building carries a plaque dedicated to the memory of Graham Flatters, 1957-1996, "who loved to wander in wild places". What you find in Glencoe today is a main settlement stretching from the A82 along the shore of Loch Leven to the north east. 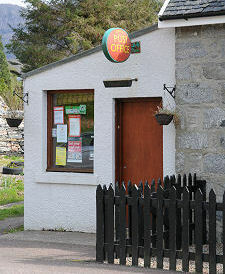 The single main street of the village is home to the village shop and, a little further along on the opposite side, the post office. There is also a village hall, and St Mary's Church. The houses range from traditional cottages through to more modern constructions, taking in more utilitarian designs en route. Perhaps the most striking of the domestic buildings are the two thatched 18th Century croft houses which now accommodate the excellent Glencoe and North Lorn Folk Museum. At the north east end of the main street is the bridge over the River Coe with, nearby, the war memorial. A road leading along the south bank of the river past cottages takes you the short walk to the Massacre Monument, commemorating the Glencoe Massacre. 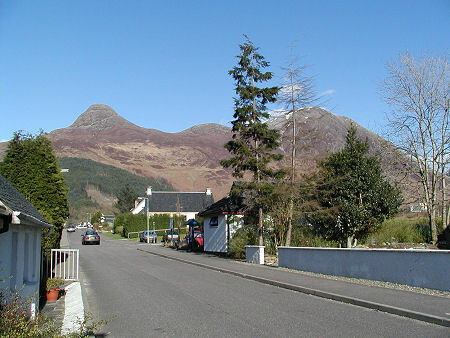 The old road along the north bank of the river follows the lower slopes of Sgorr na Ciche, the Pap of Glencoe, and brings you first to the Glencoe Youth Hostel, and then to the Clachaig Inn, a well know provider of food, drink and accommodation to generations of climbers and travellers. East of the Clachaig Inn the old road meets the A82. Near to this junction stood the National Trust for Scotland Visitor Centre until it was demolished in 2002. Its larger and more environmentally sensitive replacement lies to the south-west of the A82 a little nearer the village.